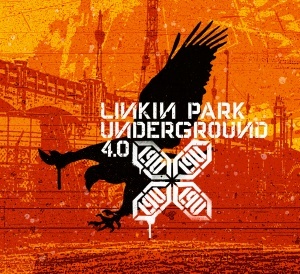 LP Underground 4.0 is the fourth CD released by Linkin Park for their fanclub, the LP Underground. On the first few years of LPU, it routinely took a couple months for people to actually receive their CDs, and in the case of the LP Underground 2.0 and LP Underground 4.0 CDs, the tracklist was kept a secret until fans started receiving them in the mail. Most of the tracks on the EP were recorded in 2004, with the only exception being "Standing In The Middle". Besides "Standing In The Middle", the EP contains another studio track, the instrumental "Sold My Soul To Yo Mama", which was likely recorded after or during the Collision Course sessions with Jay-Z, due the samples of the DVD being used on the song. "Step Up/Nobody's Listening/It's Goin' Down" is the full length version of the "It's Goin' Down" performance found in the Collision Course DVD, recorded at The Roxy Theatre in West Hollywood, California on July 18, 2004. "Breaking The Habit" was taken from the band's performance at the Rock am Ring festival in Adenau, Germany on June 06, 2004. The other two live tracks, "Wish" and "One Step Closer", were recorded during Linkin Park's third Projekt Revolution Tour. "Wish" is a Nine Inch Nails cover recorded at the Tampa Bay Amphitheatre in Tampa, Florida on August 18, 2004. Chester Bennington was able to pull a 16-second scream during the performance. "One Step Closer" was recorded at the HiFi Buys Amphitheatre in Atlanta, Georgia on August 13, 2004. Jonathan Davis of Korn joined the band during the bridge to perform his verses from "1stp Klosr". The EP contains three tracks never available on CD before as mentioned by Mike Shinoda on the CD case: "Sold My Soul To Yo Mama", "Standing In The Middle", and "Wish". The latter is one of the band's favorite songs by Nine Inch Nails. While "Step Up/Nobody's Listening/It's Goin' Down" and "One Step Closer" are exclusive to the EP, the live recording of "Breaking The Habit" is an extended version of the recording found on the Projekt Revolution '04 Tour Sampler CD. Don Gilmore, who produced the band's first two studio albums, mixed "Wish" and "One Step Closer" for the EP. Breaking The Habit - Live Sound Engineered by Tim Summerhayes. © MTV Networks Europe 2004. All Rights Reserved. The EP features band commentaries and credits for every track on the CD except for "Breaking The Habit (Live)". The credits seen on this page were taken from the Projekt Revolution Sampler. This page was last edited on 26 March 2019, at 06:05.